In advance of the Los Angeles Auto Show, Ford is excited to announce the newest member of its lineup, the EcoSport – the smallest crossover in its family, according to USA Today. Small sized SUVs are experiencing increasing popularity. This makes the launch of EcoSport perfectly timed in the market. The Ecosport is aimed towards empty nesters and millennials, who crave the versatility without needing the full size of the Ford Explorer. While similar to the Ford Escape, the EcoSport is smaller in size and sportier in design. It will be available in 2018 in four versions, the S, SE, SES, and Titanium. 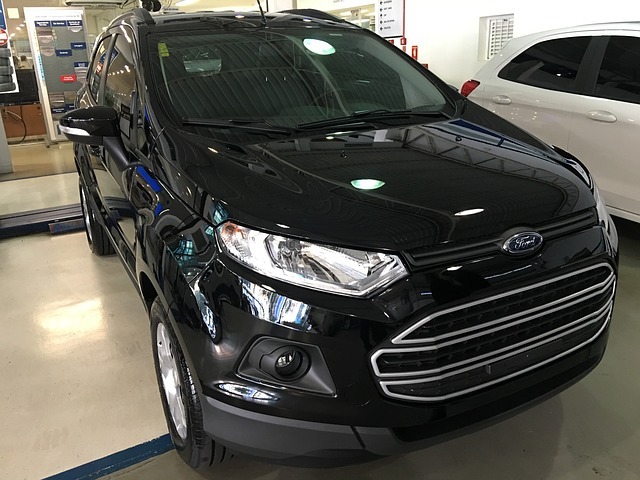 The EcoSport features a 1.0-liter three-cylinder turbocharged EcoBoost engine and front-wheel drive. Drivers will have the option to upgrade to an optional 2.0-liter four-cylinder engine with all-wheel drive. Ford EcoSport Titanium edition will boast a state of the art sound system complete with 10 675-watt speakers and feature a Harman audio system. The focus was on creating an elite, world-class music experience for Titanium drivers. The emphasis on audio made it only natural that EcoSport’s prestigious launch, titled “Go Small, Live Big”, took place at the Hollywood Walk Of Fame and featured hip-hop producer and performer DJ Khaled. The Ford EcoSport is already available in the Indian market, where it will continue to be produced. Ford will be the first American automaker to import Indian produced vehicles to the US. Contact Key West Ford today for all of the details and updates on this exciting new crossover.